Henri Desgrange had been a talented bicycle racer. He had held the hour record of 35.325 kms (without drafting assistance) and, following his retirement from racing, had retained a taste for physical exertion. In his publication, L'Auto, he urged youth to engage in sporting activities, not necessarily within the framework of organised competition, seeing in these activities a way of training the body and maintaining good health. Having been a cyclist, his inclination towards the promotion of the sport was to be expected. 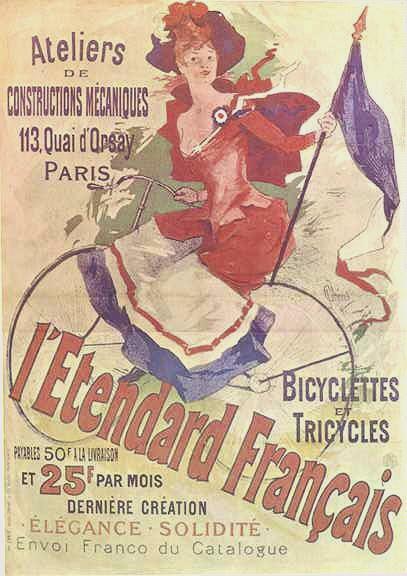 From 1901, he began to promote group cycling, re-establishing what he termed "long distance sport tourism", something that, according to him, had become dormant in France. He advocated long group excursions, events that would not degenerate into competitive races, inspired, it seemed to him, by what was happening in Italy among the members of a group called "Audax Italiano." Who were these cyclists that Henri Desgrange took as his model? Their story had begun on the 12th of June 1897, when a group of twelve riders set out to complete the distance between Rome and Naples - some 230 kilometers - in the same day, between dawn and dusk. One has to imgine the state of the roads at that time, and the technology of the bicycles used, to appreciate the difficulty of the undertaking. Under the leadership of Vito Pardo, the organiser of this out-of-the-ordinary event, nine participants arrived in Naples in the evening of that day. Newspapers spread the news of the success of the attempt. They distinguished with the term "audace" - audacious in Italian - those who had finished the event. This term - "audace" - was soon translated into Latin - "Audax" - and this name stayed with them. Neapolitan cyclists, no doubt somewhat jealous of the success of their Roman counterparts, undertook to do the same route, but in the reverse direction, between Naples and Rome. Twenty of them made it to the finish, and it was during the course of a reception held in their honour that it was decided to initiate a group of skilled riders who could manage 200 kilometers or more in a day. This group took the name "Audax Italiano." And from this starting point, the model of long group rides, led by a ride captain, spread throughout Italy. Sections sprang up in the major towns, and the number of cyclists awarded the "Audax" designation, never ceased growing. It was this model of a group excursion, strenuous in light of the distance involved, that Henri Desgrange wanted to introduce to those who had abandonned competitive cycling and were balking at taking up the sport again. He thought in this way to give them the taste for cycling again,less intense but no less salutary for physical well-being. In 1903, the Italian Audax group announced their intention to ride to Paris the following summer. Desgrange lamented the fact that there was not a group in France that could emulate the Italians. It was then that Georges Lefevre, the same person who was to originate the idea of the Tour de France, wrote a series of articles in L'Auto in which he described the Italian group and their proposed undertaking. He set forth the idea of a reception of the Italians by a group of cyclists from the French capital who would ride before their Italian counterparts on the route. For this he required a group of cyclists who were themselves capable of riding a long distance in a group. He suggested that L'Auto become involved in the undertaking and become the spearhead of the renewal of sport tourist cycling in France. On the 7th of January, 1904, Henri Desgrange announced, on the front page of L'Auto, his intention of founding a French Audax organisation, modeled on Audax Italiano, following the ideas set out earlier by Georges Lefevre. After several preparatory outings led by Charles Stourm, another colleague at L'Auto, the first official ride of the French Audax took place on April 3, 1904 on a route between Paris and Gaillon. Of 37 participants, 29 succeeded in travelling the 200 kilometers required to obtain the designation "Audax." They were rewarded by a numbered medal and a corresponding certificate of achievement awarded by L'Auto. Charles Stourm, who had acted as ride captain on this historic ride, was awarded the first numbered medal. This badge was enamelled in yellow, the same colour as the pages of L'Auto. (Translator's Note: Yellow remains the signifying colour for 200 kilometer brevet medals to this day.) This is how yellow became the distinctive colour of French Audax, long before the colour became associated with the leader of the Tour de France, an event that would not be created until 1919. We have shown that French Audax was a creation of Henri Desgrange, for whom these riders were every bit as important as those who rode the Tour de France. Each year in the pages of L'Auto, the rides of Audax were listed together with competitive races like Paris - Roubaix, Paris - Tours, or the Tour de France, in the calendar of events published by the paper. Until his death in 1940, Henri Desgrange served as honorary President of Audax, attentive always to the activities of the organisation. His work was carried on by Jacques Godet, his spiritual son, who embodied completely the spirit of the sport. For him, in this modern world, Audax was wisdom, and, further, Audax was health: a philosophy of sport for the sake of participation rather competition, and for the sake of physical well-being.